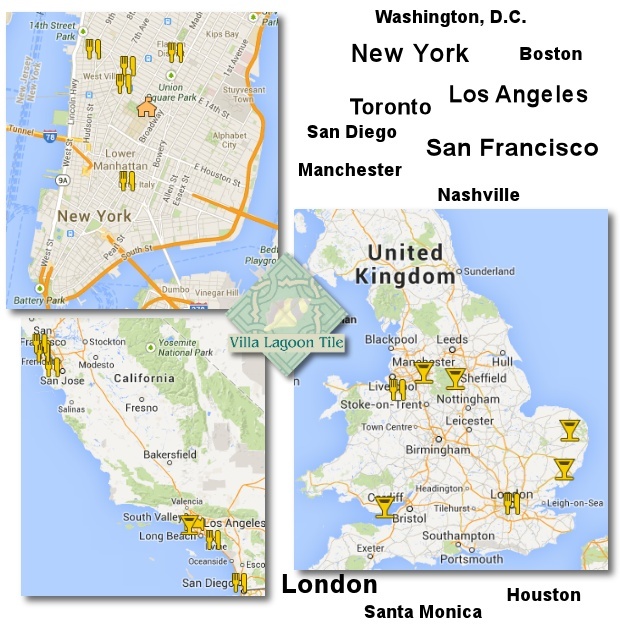 Putting Villa Lagoon Tile on the Map! At Villa Lagoon Tile we strive to provide the greatest value at the lowest cost. A big cost saver comes from leveraging the power of the internet to minimize our need for a costly network of showroom floors… our website is our showroom! Unfortunately, for those who aren’t already familiar with the beauty and elegance of hand-made cement tile, the computer/tablet/phone screen can’t always convey the richness and grandeur of this fabulous tile. We recently began a project of mapping out our installations to solve that very problem. Over the years we’ve delivered tile for some fabulous commercial customers. Great restaurants, hotels, universities, barbershops and retail establishments across the globe now have Villa Lagoon Tile on their floors, walls, and even hostess stands. This is an evolving work in progress, so check back occasionally. You may just discover your new favorite restaurant! As always, be respectful, and tip your server. If we missed putting your commercial installation on the map, please let us know; we’re happy to help publicize our great business clients.